Where? Who? What? Whether? Yes. After two very long months on the road traveling and recording and scheduling and etc. every day, I was more than ready to take a break. I looked forward to my week in Omaha between Serbian gigs with eager expectation. Not that I could afford to only rest. I had the next Leaf to plan, some car maintenance to take care of, songs to mix down, other songs to scratch out, etc. ad nauseum. But I wouldn’t have to worry about where I would sleep that night and I could unwind a bit without the pressure of daily travels. Unfortunately, I could neither rest nor take care of business. My computer had been acting up more and more since installing Service Pack 3 somewhere around Georgia. It is a very nice HP laptop which I got in Korea. It originally came with Vista but I wouldn’t go near Vista with a ten-foot pole if it were the last OS on earth, among other idioms. So I asked the shop if I could get it downgraded to XP, which they were magically able to do. I say magically, because as you will see I was not able to do the very same thing. By the time I was in Memphis, it was so bad that it was interfering with recording. Constant BSOD’s are annoying when you are trying to record musicians in a limited time frame. This problem needed to be fixed, ASAP, or the Tour would be cancelled. So I spent my entire week in Omaha trying to get my dang laptop working again. After hours and hours on the phone with HP support, it became apparent that I could get no help from them unless I installed the original OS, the name of which I have used too many times already in one day so let’s just say it loosely rhymes with Batista, and seems to have similar dictatorial habits. “Are you talking about Vista?” asks the unnamed, unattractive passerby. DON’T SAY IT!! Saying it gives them more power. It is the OS Which Must Not Be Named. Fine. So after getting little help from HP’s friendly tech support staff in India, I was on my own. I have had some luck previously doing a repair install of XP. But when I popped in my XP CD, I discovered that it couldn’t even recognize the hard drives; in order to see them I would have to a) buy a USB floppy drive in order to provide SATA drivers during the install process, or 2) burn my own XP install disc which included the drivers. Option 2 was free, so after downloading nLite and SP2 (didn’t want to risk SP3 again just in case), I made my own XP SP2 disc with SATA drivers using my existing XP disc and nLite, which is by the way a marvelous tool for XP users when they face the (inevitable?) reinstall. This process (phone calls, research, burning) took six days (and six nights). The burner in my second computer crapped out along the way so I had to get creative with a live Linux CD (yay Knoppix) to be able to burn CDs from a nonworking computer. The planned departure date for Leaf 3 came and went. Two days and three installs of XP later, I had a semi-stable XP SP2 up and running. I had tracked down various drivers from Intel, HP, an online guide, and even a Korean online guide. Maybe I didn’t get the right combination of drivers, however, because I’m still getting random blue screens, even with non-crucial devices disabled. Java in particular seems to provoke a crash of either the program (Opera is guaranteed to crash on the new Facebook, and another Java tool I use will occasionally disappear mid-use) or the entire OS. Anytime I do anything disk-writing intensive, I’m guaranteed a crash, which is great fun when I get a BSOD while an install program is in the middle of writing to the registry. Downloaded files are sometimes corrupt and I have to re-download them. Other times it crashes seemingly randomly. The event log provides no clues. ARGH. If only there were an alternative to Windows-only Sonar that I could seamlessly transition to. But I love my Sonar — it’s the best “total package” audio production tool I’ve used, particularly from the usability standpoint. You don’t need to read a manual just to get simple things done, because it’s so intuitive (yes, I’m talking to you, Pro Tools). The development team responds to the needs and requests of its userbase, and it fully supports both DX and VST plugins. I only wish they made a version that ran on a different OS. Since it was stable enough to record and I had been delayed almost too late to even do Leaf 3, I hit the road anyway, despite the instability. But I have another break in mid-October, where perhaps I’ll try different drivers, perhaps even the XP BlackEdition that these Korean sites are recommending. I’m wondering how the shop did it, since I have tried a number of combinations of drivers with no success. Thankfully, my stay in Omaha wasn’t all frustrations. I enjoyed regularly sleeping in a bed. 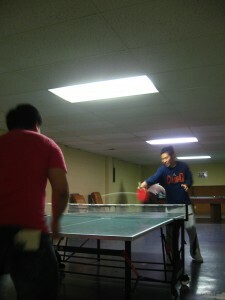 I beat all my friends at ping-pong. I made and ate some soft, chewy cookies. I watched as my friends worshipped Rumiko. I played a couple games of Age of Mythology. (I hadn’t played computer games in like half a year!) I enjoyed some fine Fitz’s root beer and cream soda that I had brought with me from St. Louis. I’m on the road again. My computer is not on the fritz, but it’s certainly not on the level either. HP and Microsoft should hire local support help. The WINE people should get Sonar running stably in WINE. Everyone should be on my album. My friends should all spend a year teaching in Korea with me. Soft, chewy cookies should be available worldwide. The US Presidential elections should start over from scratch — we still have time! People should only pay for outgoing calls. Bars should throw out that awful “Mojito mix” and buy some real limes and fresh mint. People should stop suing people over ridiculous things. Children should spend some time playing outside. A Taco Bell should open in Seoul. A Dr. Fish should open in Omaha. Everyone should recycle and live greener. People should stop putting strawberries in rhubarb pies. In a nutshell, the world should be as I want it. But it’s not. So why not make some great music? Delay installing the carputer in my car. Taking my grandmother to eat some delicious Korean food. Delay fixing the A/C and cruise control in my car. Moving my 50-gallon aquarium from a babysitter’s to a temporary owner’s. A final rehearsal with my Serbian band. Delay procuring sound system components for my car. And this one just in: my 10-year high school reunion is in Omaha this coming weekend. “OMG,” says a nearby person who speaks in acronyms. “WTF? LOCIE!” Other than remarking that the last acronym is made up, I completely ignore that person. “Oh my goodness,” says a nearby person who speaks normally. “What in the world? Lots of car issues, eh?” Yes. Let us now discuss some of these factors. Or, just let me. I’ve been drumming for a Serbian band, playing Serbian pop and folk music with more electric instrumentation (it’s pretty sweet, I’m the token non-Serbian). I’ve planned the Tour around gigs with the Serbian band; I’ll hit Omaha (or sometimes KC) just in time for gigs, then launch on the next Leaf. Again, pretty sweet. is great. When I got back from Korea she wanted to go eat Korean food with me, since I had been extolling the virtues of delicious Korean food. This has not yet happened. It shall and it must. is this weekend. In Omaha. I really ought to go to it. I had a small graduating class of 36 and was quite close with many of them, and friends with the rest. It shall be a two-day extravanganza, with feasting on Italian food and recreating at Mahoney State Park and who knows what else. I am going to go and enjoy my friends and avoid reflecting on how old I am and all the things I haven’t accomplished yet. Sound good? Until now, faithful blog readers, I have remained mute on the subject of my car. This is because my car is awesome and deserves its own post.